Put your confidence in a service in Canary Wharf with a rating of over 96%! Q: What does the window cleaning in Canary Wharf involve? Q: Who will polish my windows? A: Our service will be carried out by seasoned and police-checked Canary Wharf window cleaners. They'll also be dressed in branded uniforms, so you'll easily recognise them as soon as they appear near your property. A: In essence, this is an extendible rod that blasts water under high water pressure. It allows the experts to reach the fourth storey of any business or residential building from the safety of the ground. Q: Will you connect your gadget to my building's water source? A: Not at all! The team will use a special filtered water storage inside their caravan. However, if the tank is empty, we will happily welcome your offer. Q: Are there any requirements that I should meet ahead of time? A: You need to make sure that there will be a free parking space within 30 metres from your domain and on the same side of your windows. The professionals also need to have an effortless access to your property. With the proven water-fed rod equipment, the experts can help you outclass your competition at fair rates. And you can press down our window cleaning Canary Wharf rates even further by mixing two or more of our cleaning services together! To check the exact numbers behind our price offers, make sure to browse our convenient price table below. Irrespective of where your smudges have taken refuge, our efficient window cleaning in Canary Wharf will eliminate them with ease. We have included several washing methods. 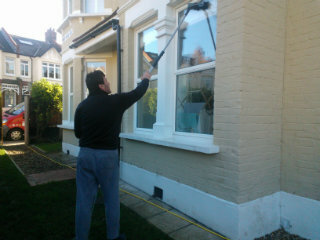 Our external window polish is designed for properties with no more than four storeys. To let the daylight back inside, the window cleaners in Canary Wharf will arrive in a vehicle, equipped with a retractable water-fed pole. This system is linked to a water container, filled with purified water. After being ejected as a powerful flow from the pole's brush-head add-on, the water will absorb all smears in an attempt to restore its original structure. To get to smudgy window corners of lofty properties, we'll send an established team for rope access window washing. These approved abseilers will utilize frequently inspected ropes and harnesses or set up ladders and cherry pickers to restore the glamour of your panes. We've got all essential COSHH documentation in place and follow every safety instruction. To make the in-house facet of your glass façade just as glossy, the experts will depend on the established ladder and sponge cleaning procedure. Over time, we've reacted to the washing calls of customers from many nearby regions. As a direct result, we expanded window cleaning Canary Wharf's horizon and you can now see our washing caravans in the locations below. Another quick and easy way to get a free instant quote or to book window cleaning services Canary Wharf E14 is through our web site.